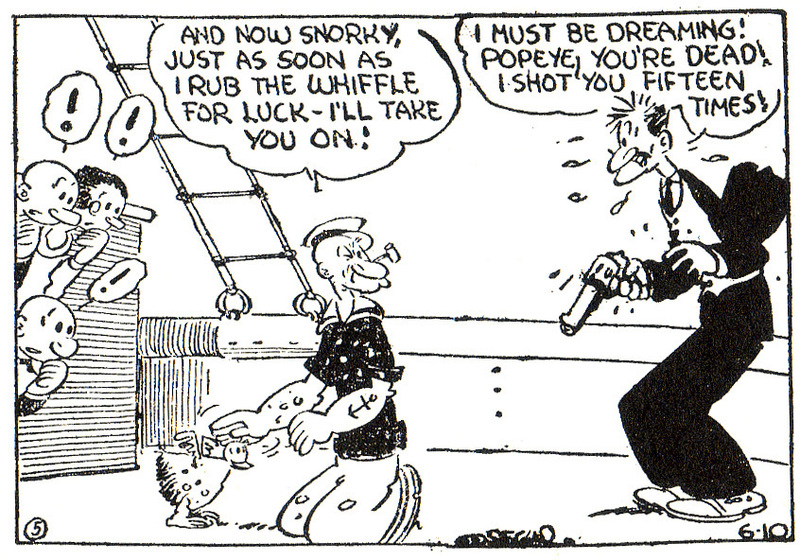 On January 17, 1929, Popeye made his first appearance in E.C. Segar's comic strip Thimble Theatre, and the spinach-eating sailor with the oversized forearms and corncob pipe would not only go on to become the strip's most popular character, but also see his star rise to the uppermost levels of comics royalty in the years that followed. 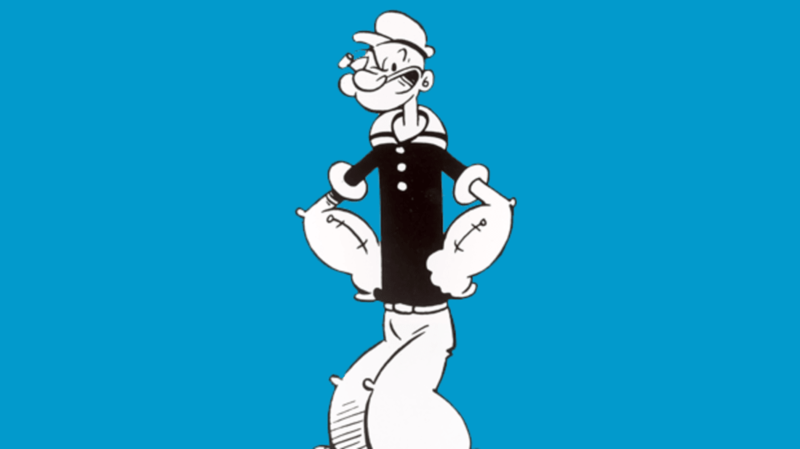 Considered by many to be one of the greatest comics—and cartoon—characters of all time, Popeye was an unexpected success for Segar and the publishers of Thimble Theatre, and he went on to spawn a wildly popular animated series, multiple iterations of comic strips, and even a live-action film. In honor of Popeye's 85th anniversary, we've compiled a list of 15 things that you might not know about the famous sailor. 1. Thimble Theatre was already 10 years old when the famous sailor made his debut. Popeye quickly became so popular among readers that he was brought back in a recurring role, and eventually became the main character of the strip, which was subsequently renamed Popeye in the 1970s. 2. Popeye creator Elzie Crisler Segar (better known as E.C. Segar) often signed his work with simply “Segar” or “E. 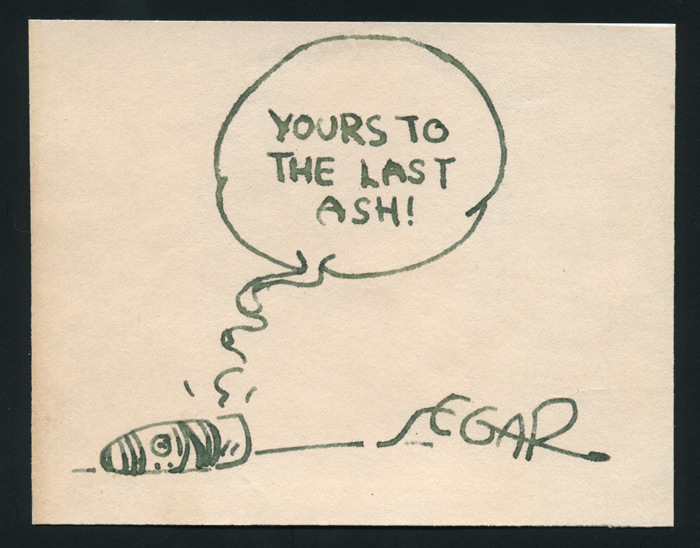 Segar” above a drawing of a cigar, as he was often asked how to pronounce his surname. 3. During the first ten years of Thimble Theatre, Segar's comic strip chronicled the misadventures of Olive Oyl and her then-boyfriend, Harold Hamgravy. When Popeye became the focus of the strip, Olive eventually took an interest in him. 4. Olive Oyl's family included a brother named Castor and her father, Cole, who were both regular characters in the original comic strip, but made fewer appearances as the focus of the strip shifted to Popeye. Castor was the instigator of many of the schemes that got Popeye and Olive in trouble. 6. 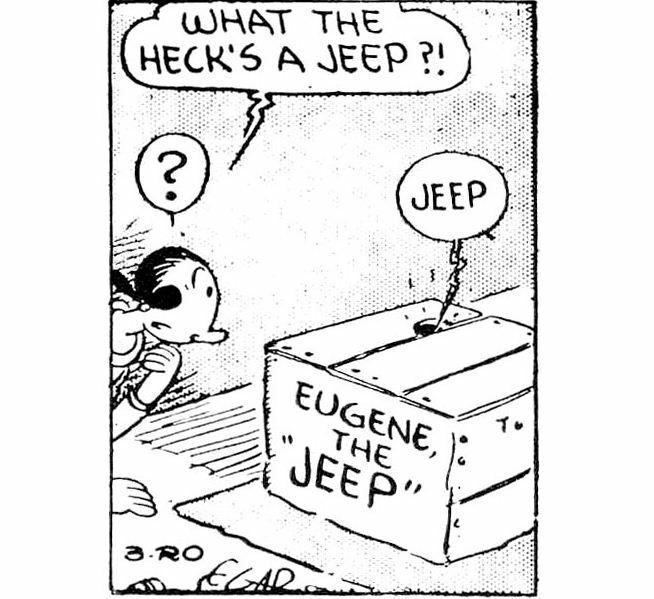 One popular theory regarding the origin of the “Jeep” brand of off-road vehicles that debuted in 1941 suggests that American soldiers were so impressed with early versions of the vehicles that they named them after “Eugene the Jeep,” Popeye's magical pet that debuted in the comic strip in March 1936. The creature could travel just about anywhere—a trait it seemed to share with the new style of off-road military vehicles. 7. In E.C. Segar's hometown of Chester, Illinois, a project is currently underway to produce a series of “Popeye & Friends” statues depicting various characters from the comic strip at a rate of one per year. 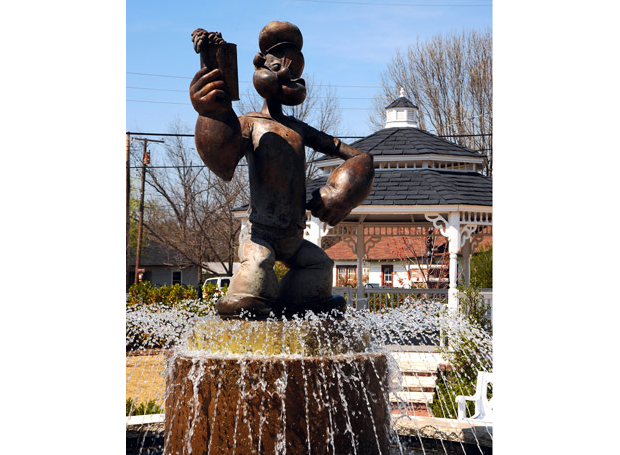 The statues will be placed at various locations throughout the town, with each new statue dedicated at the annual “Popeye Picnic” at the park named for Segar. The last statue—of Segar himself—is expected to be unveiled in 2020. 8. The character of Popeye entered the public domain in 2009 for every country except the U.S., where it remains under copyright until 2025 at the earliest due to Segar's creation falling under the “work for hire” rules regarding U.S. copyrights. The character is considered a “work for hire” creation because Segar was an employee of King Features Syndicate when he introduced Popeye into the Thimble Theatre comic strip. 9. While spinach is generally regarded as the source of Popeye's strength, a series of mini-comics published in the late '80s by Quaker Oatmeal featured Popeye powering up to fight villains by eating one of the company's four flavors of instant oatmeal. The marketing campaign ran into trouble, however, when Popeye's altered catchphrase, “I'm Popeye the Quaker Man!” offended members of the Quakers religious group. The group is a strong advocate for pacifism, and Popeye's two-fisted adventures prompted complaints from Quakers, and resulted in the line being removed from the comics. 10. Popeye was originally voiced in the Fleischer Studios' cartoons by actor William “Billy” Costello, and then by Jack Mercer after Costello was dismissed (allegedly for becoming too difficult to work with). An apprentice animator, Mercer received the gig when Lou Fleischer (the head of Fleischer Studios' music department) heard him imitating Popeye's voice while walking through the studio. Mercer famously ad-libbed much of Popeye's subtle, under-his-breath remarks that became a staple of the series' humor. 11. Popeye wasn't always a spinach fanatic. In early stories from the Thimble Theatre comic strip, the sailor gained his special powers by rubbing the hairs on the head of a magical Whiffle Hen named Bernice. In fact, Popeye almost dies in his inaugural adventure, only to recover from otherwise fatal gunshot wounds by rubbing Bernice's head. 12. The 1980 live-action film based on Popeye was only pushed into production after Paramount Pictures lost a bidding war for the rights to a live-action film based on the Little Orphan Annie comic strip. 13. The live-action Popeye movie was Robin Williams' first starring role in a film. 14. Rumor has it that Popeye's iconic appearance is based on real-life boxer Frank “Rocky” Fiegel, a native of Segar's hometown who was known to be a fierce brawler and had an affinity for a corncob pipe. In 1996, Fiegel's unmarked grave was given a headstone commissioned by The International Popeye Fan Club.